Meru Health is an online specialty clinic for depression (& burnout/anxiety) treatment with pay-only-for-outcomes business model. 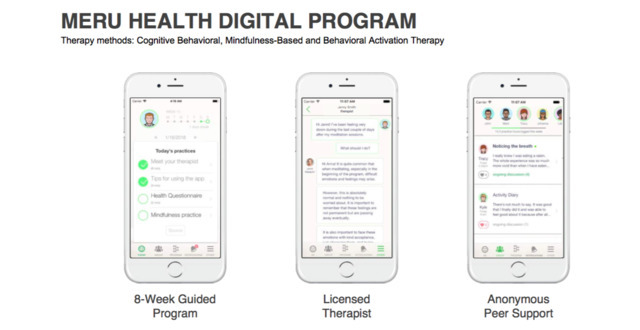 Meru’s 8-week treatment program combines psychological treatment modules (cognitive behavioral-, mindfulness-based and behavioral activation therapy), patient’s personal data (biometric, behavioral, self-report) and a personal licensed therapist. Meru Health individualizes the treatment program based on patient’s personal data and needs. 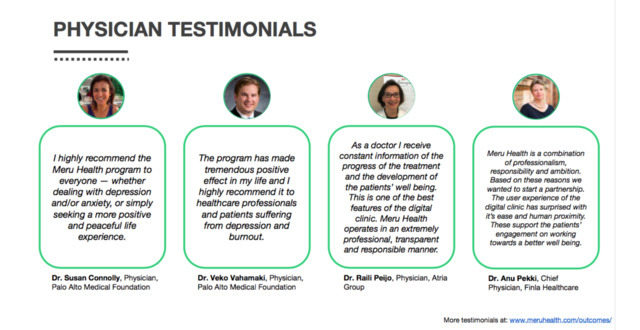 Meru Health’s clinical results are exceptionally good surpassing most antidepressants and traditional psychotherapy treatments. Average access-to-treatment time for Meru Health is 1-3 weeks from referral . Meru Health works with Stanford University, Veterans Administration, University of North Carolina, Palo Alto Medical Foundation etc. With most customers, Meru Health is used as a benefit for employees. Meru Health was featured in a VatorNews article: "Video: Meru Health, Supportiv, 7 Cups, Bravely"
Meru Health was featured in a VatorNews article: "Community support and finite treatments for mental health"